I have been having a wonderful time looking through all my photos for pictures of cars. It’s going to be fun sharing some of my finds. 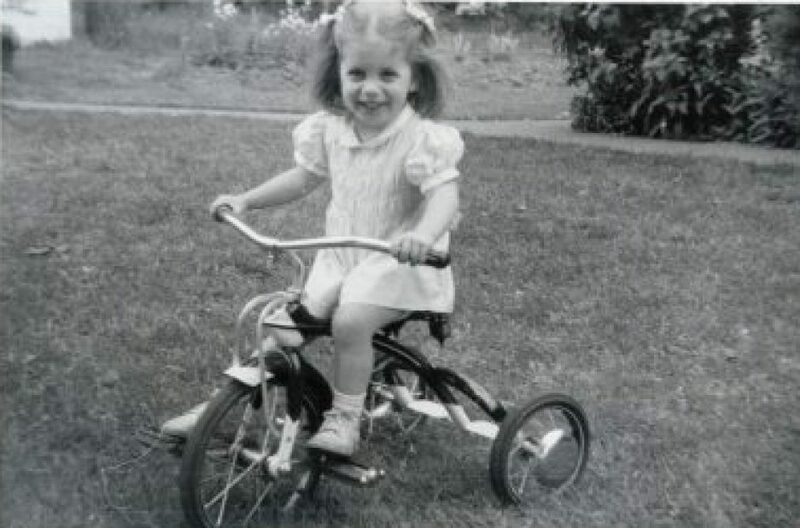 Here I am at two, test driving my first car. It is not only manual transmission, it appears to be 0 horsepower and 2 footpower. Nonetheless, I seem intent on making the best of things. I am not sure who is supervising my ride. He doesn’t look like anyone in my family, so I suspect it was a neighbor.I saw a car like this on Antiques Roadshow not too long ago, which I guess makes me an antique also! The cars little kids can drive now are fairly frightening. They have batteries and the kids zoom all over their yards and sidewalks. I wouldn’t trust a child in one, and shudder when I watch one in the neighborhood cruising along. Even though they aren’t my kids, I keep watching to see if they veer into the street. There was certainly something self-limiting in the car I am driving. I imagine it got pretty tiring pretty fast moving it forward in little steps. As you can tell from my home page, I quickly turned to the three wheels of my beloved trike. It went faster with the same expenditure of energy, and the tires had better cushioning. I didn’t drive a real car for many years. But that story has to stand in line behind a lot of other great vehicles to come.